Life Data® Hoof Clay is a non-irritating, easy to handle and sticky clay that easily packs and remains in place within wall cracks, wall defects, old nail holes, hoof wall separations and sulcus of the frog. The ingredients iodine and tea tree oil give the product unique properties to provide protection for extended periods of time. Life Data® Hoof Clay can be used on shod and barefoot horses. Water, mud, feces, debris and microbes can invade old nail holes, hoof cracks, the white line and other areas of the hoof such as the sulcus of the frog. To be effective hoof packings must be sticky enough to stay in place for extended periods of time. Whilst there are many hoof packings on the market, most contain caustic ingredients that are harmful to tissue. The product label may advise you to wear gloves and to keep the product away from the horse's sensitive tissue. Unlike other hoof packings, Life Data® Hoof Clay is non-caustic and stays in place to provide protection for several days. The ingredients iodine and tea tree oil give the product unique properties. Life Data® Hoof Clay is a natural, easy to handle, and sticky clay that can safely be applied with your bare hands. It stays within wall cracks, wall defects, old nail holes, hoof wall separations, under shoes, and the sulcus of the frog for extended periods of time. In barefoot horses, an effective amount of Life Data® Hoof Clay will stay in the sulci around the frog and on hoof wall defects for about 2 to 3 days in wet conditions; whereas in dry conditions, the clay will stay for approximately a week. 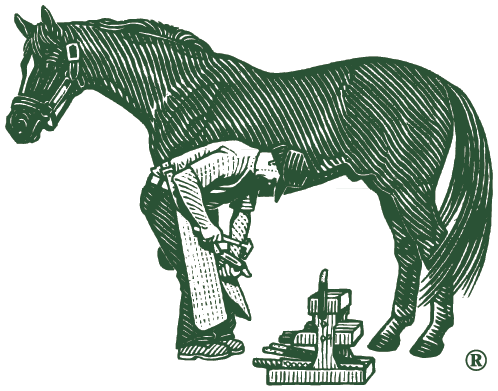 In shod horses, many farriers apply a coat of Life Data® Hoof Clay along the white line area at each reset prior to nailing on the shoe. Available in a 284 gram (10 oz) wide mouth jar. Contact the Life Data Labs, Inc. EU Sales Representative, Karen Zetsche. EU Sales Representative, Karen Zetsche. Water, mud, feces, debris, and microbes can invade old nail holes, hoof cracks, the white line and other areas of the hoof such as the sulcus of the frogs. To be effective, hoof packings must be sticky enough to stay in place for extended periods of time. Whilst there are many hoof packings on the market, most contain caustic ingredients that are harmful to tissue. The product label may advise you to wear gloves and to keep the product away from the horse's sensitive tissues. Unlike other hoof packings, Life Data® Hoof Clay is non-caustic and stays in place for several days. The ingredients iodine and tea tree oil give the product unique properties. In barefoot horses and wet muddy conditions, an effective amount of Life Data® Hoof Clay may stay in the sulci around the frog and on hoof wall defects for about 2 to 3 days; whereas in dry conditions, it may stay for approximately a week.